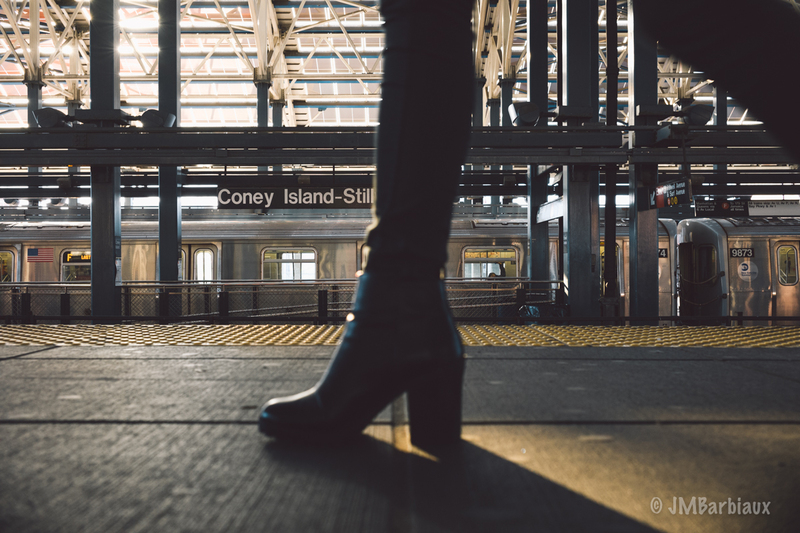 The plan had been to spend a few days shooting around Brooklyn (think downtown and surrounding neighborhoods) and an evening shooting at Coney Island. 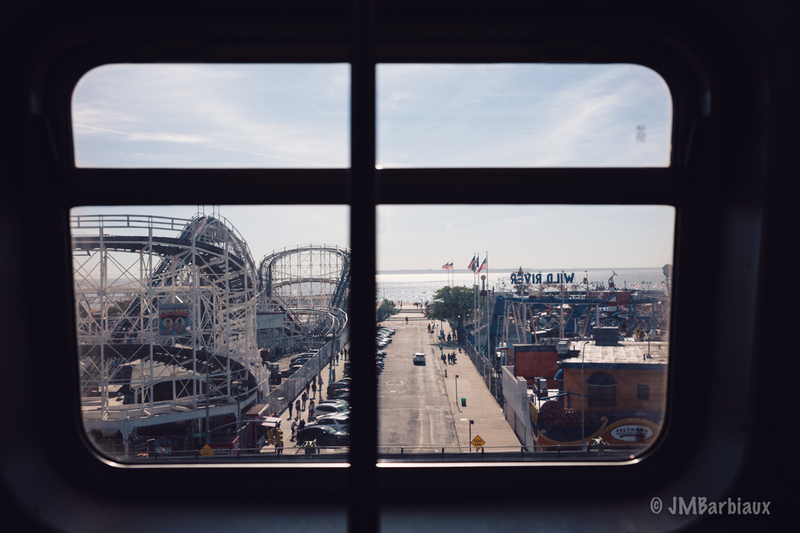 However, like many street photographers before me, I was entranced by Coney Island and was pulled there like a sailor pulled towards Sirens (You literature nuts know what I’m talking about… For the rest of you, just Google the words: Odyssey Siren). 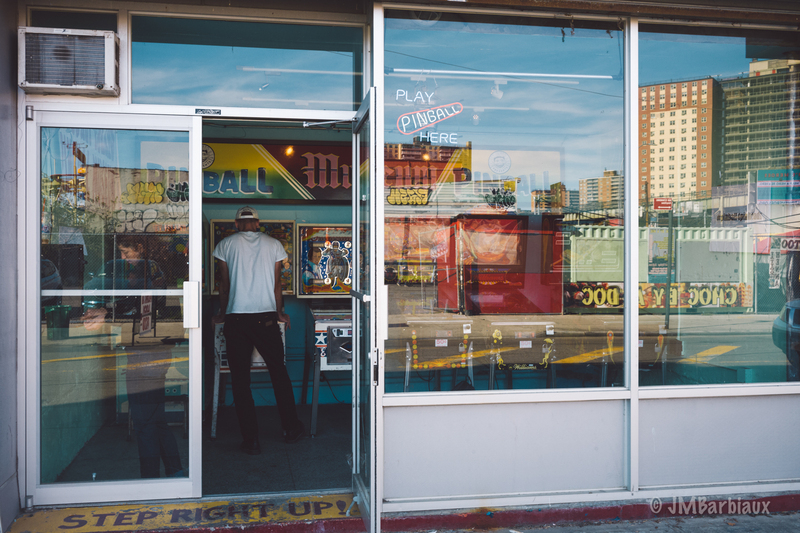 I wanted to share the experience of shooting Coney Island, from start to stop, with all of you in the article below. There is something surreal about a beach and theme park built this close to NYC, one second you’re on a crowded subway car, last departed from some underground station smelling of urine and body odor, and the next you’re getting smacked in the face with the salty air of the ocean (and still a little urine as you’re still in the subway station for a few more minutes… then the salty ocean air!). 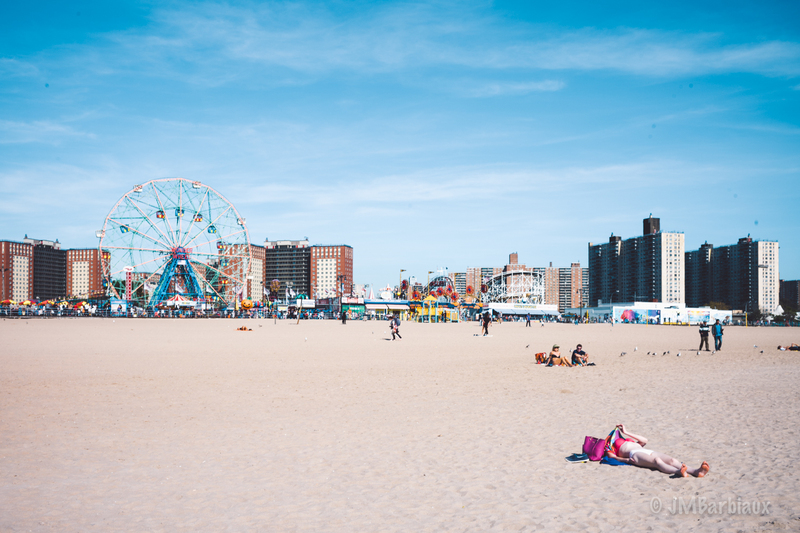 Honestly, you don’t even need to know the long history of Coney Island to recognize the Americana simply emanating from the area. Now Coney Island, the park itself, does not really cover a huge area… Probably only four or five blocks along the boardwalk. With that being said, I spent all of my time walking along the boardwalk, down the alleys along the theme park, and the street on the opposite side of the boardwalk and still had not run out of potential shots. There is literally something around every corner and it changes as the light does (like most areas). 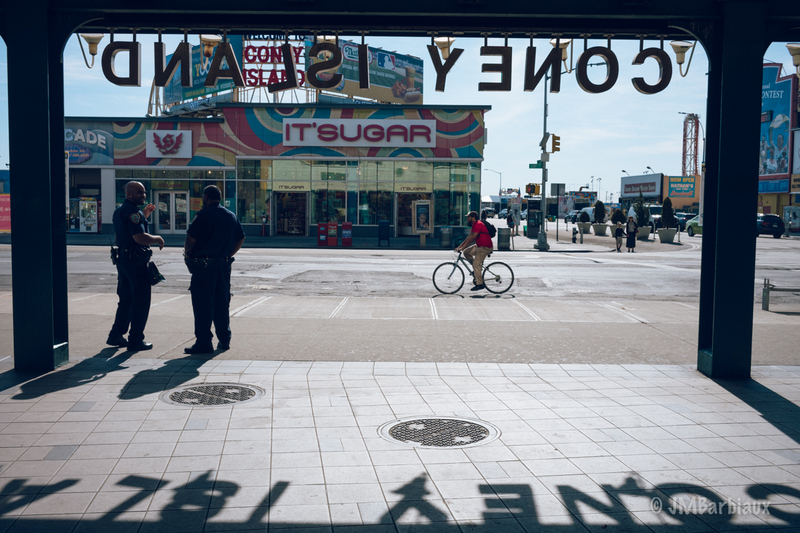 When I revisit in the summer I will spend much more time exploring the town around Coney Island. When you first exit the subway station there is a giant lifeguard chair sitting next to the subway gate, as soon as you see this you’re aware that you’ve arrived. There are two or three stops along the theme park stretch of the boardwalk but this was my favorite because of the Coney Island sign you see in the image above. Initially I shot it looking towards the station but the second day I visited I noticed the shadow of the same sign on the ground and took this shot, it was my favorite. 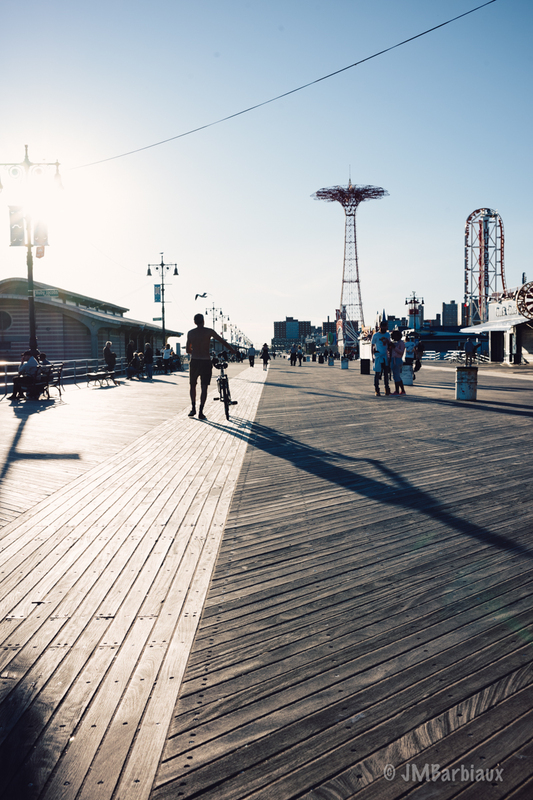 A view of the iconic Coney Island boardwalk. As this was off-season there was just a fraction of the people who would be here during the summer. 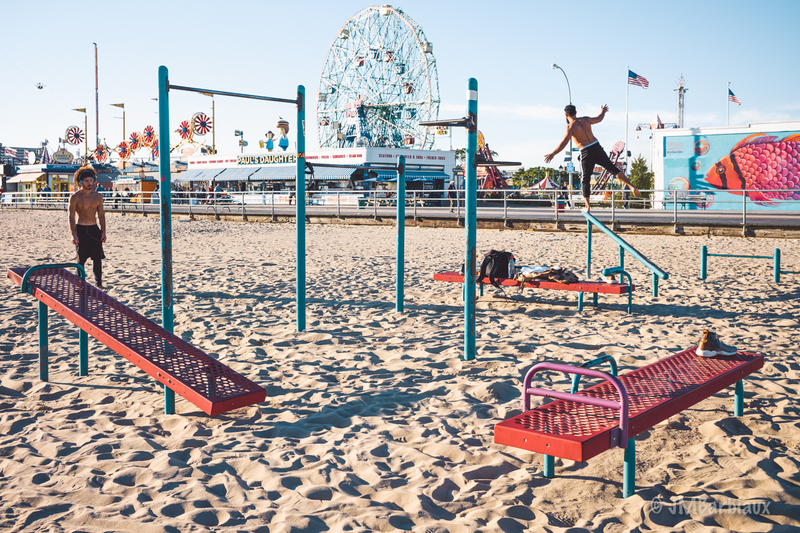 Having not planned on shooting the majority of my street photos at Coney Island, I found myself there in October (the off-season). Most of the businesses had already closed for the season and the ones that were still open had very limited hours. 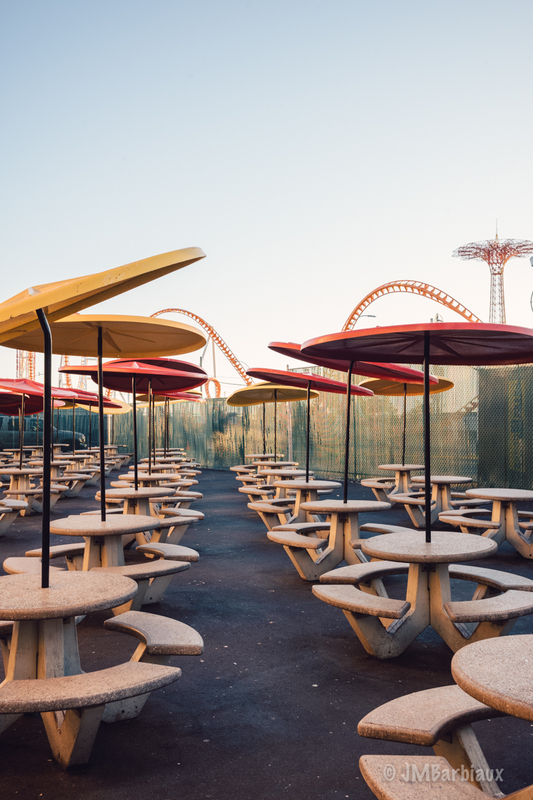 This meant that there was only a fraction of the people who usually visit Coney Island which has its ups and downs. The positive was that creating images without lots of distractions (people walking through at inopportune times) was a breeze. The downside was two-fold; there weren’t as many people to photograph and the ones that were there saw me coming from a mile away because there weren’t many other people with a camera coming towards them. Take the image below for instance… After I took a few shots of this guy he hurled himself over the railing, yelling obscenities at me, and ran down the beach about 500 feet or so. Awkwaaaaard? Sure. But I like to think I contributed to his cardiovascular workout that day. Always! take your workout bands with you… You never know when you’ll need to bang out a few reps.
Let’s talk about the image above for a minute… Nostalgia works for street photography in a big way. If you look at some of the street photographers who are really popular these days and really read about them you’ll notice that some weren’t real well reviewed in their time. Crazy right? We look at their images now and they invoke feelings of nostalgia that make it hard to understand how everyone that viewed them couldn’t have loved them. What we sometimes forget is that when they were creating the photos many weren’t evoking feelings of nostalgia because 30 years ago the cars/businesses/signs were present day objects. Imagine a photo with a kid in skinny jeans standing next to his Toyota Camry today. Boring right? Now imagine a kid from the fifties with cigarettes rolled into the arm of his t-shirt standing next to his Mustang. A little more interesting. What is my point? 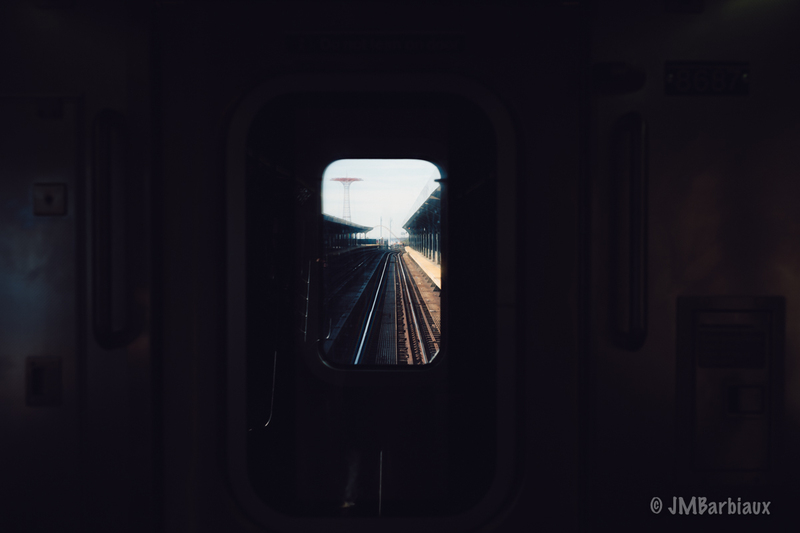 My point is, even though today some of the images I capture may seem mundane to me, I am constantly looking at the world through my “50 years from now goggles”. If I think it will be significantly more interesting in 50 years I will capture it with my camera. This doesn’t mean that I’ll share it with anyone just yet but I’ll have it in my archive for future use. Sunbathing without a care in the world. As I mentioned above, it was off-season when I was visiting so there were very few people compared to the summer season. This worked in my favor when creating images like the three above. Having very few other elements in the frame with the sunbathers really isolated my subjects. In addition to isolating the subjects, the lack of huge crowds invokes the question of why. Why wasn’t there more people, why is she wearing her underwear instead of a bathing suit? Oh, and where is the dude’s (directly above this paragraph) other sandal? Most beaches have the obligatory workout stations, they are a hot spot for interesting scenes. If you’re new to street photography and want to ease into it by photographing subjects who aren’t likely to mind… Head to where people work out outdoors. Anyone willing to workout in front of an audience is typically looking for attention. They thrive on the attention and will work for your camera. When I showed up at this spot the guys were doing pull ups. I didn’t say a word and started walking around them taking photos of them with the park in the background. After about 5 minutes the guy on the right decided it was time to do his balancing act. As soon as I left they went back to doing their pull ups… Coincidence? Nope, I have a bunch of images with similar results from beaches on the East and West Coast. The leg tattoo caught my eye. 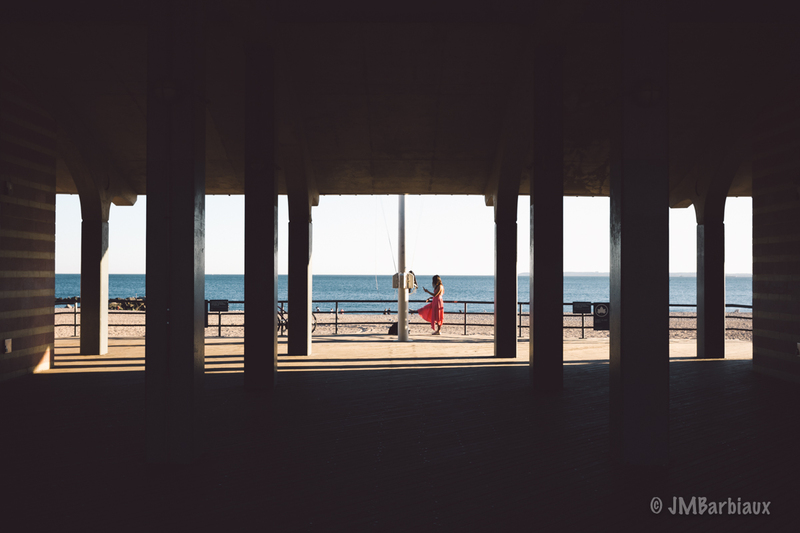 While walking down Coney Island Boardwalk I spotted this woman taking selfies of herself (above) in a beautiful dress. The contrast between the bright dress, sky, and beach with the dark shadow area of the bathrooms made for a perfect scene. I simply had to wait for her to strike a more interesting position and I took the shot. The pillars and shadow area made for a perfect frame. As an aside, I have never seen so many people photographing themselves as I did while in Brooklyn. I’m sure I just never noticed before but WOW. We are definitely a selfie culture. 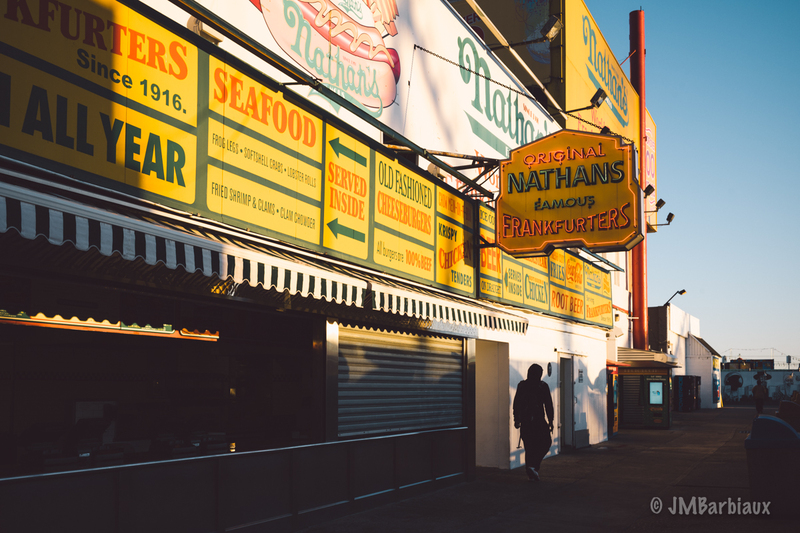 I couldn’t leave Coney Island without working Nathan’s Famous Hot Dogs into a couple of images. There is a giant scoreboard style sign on the other side of the building counting down to the next hot dog eating contest. Fun fact, Nathan and his wife Ida started the business at Coney Island for $300… At the time, that was their life savings. The business started as a nickel hotdog stand in 1916. Contrary to the gentleman in fatigues sleeping behind the restaurant, the hot dog was not invented here. The hot dog, or Frankfurt as it’s called in Germany, is said to have been invented in Frankfurt Germany (you can read more about hot dogs here). Seating area beside the Nathan’s Hot Dog shop. 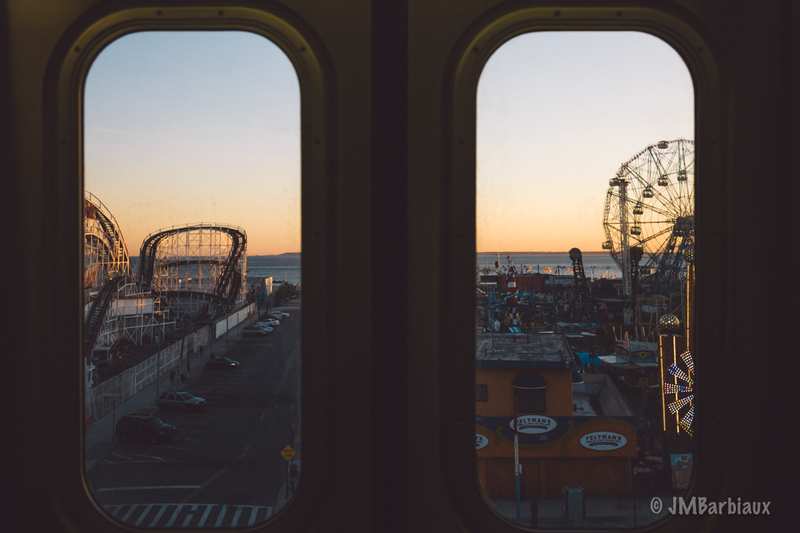 Coney Island from the subway car on during sunset. It was with a heavy heart that I left Coney Island for the last time. I vowed to return in the summer when the crowds returned and the days were longer. 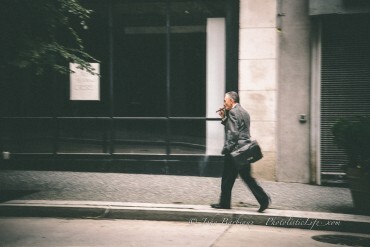 I can easily see why this is a favorite spot among many street photographers. 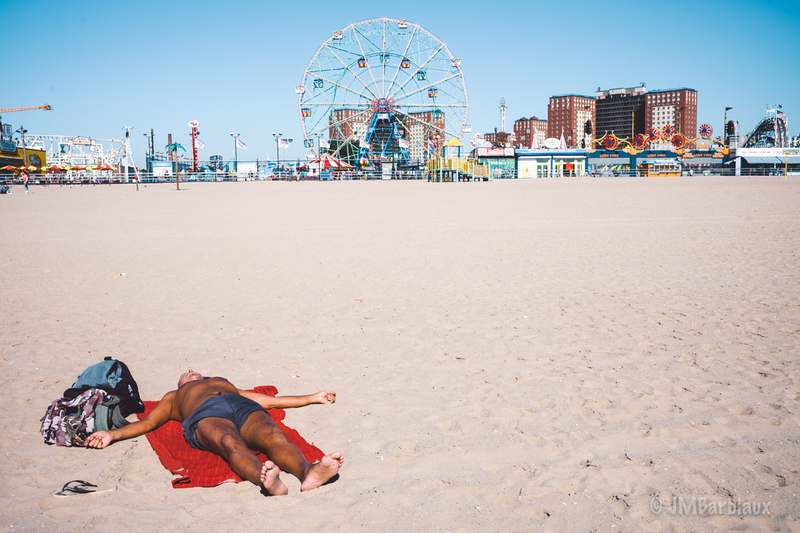 It is a difficult thing, articulating what exactly one feels when they visit Coney Island. Familiar but not, it’s definitely Americana at its finest. There is a combination of old and new but mostly old… Perhaps that is the familiar. 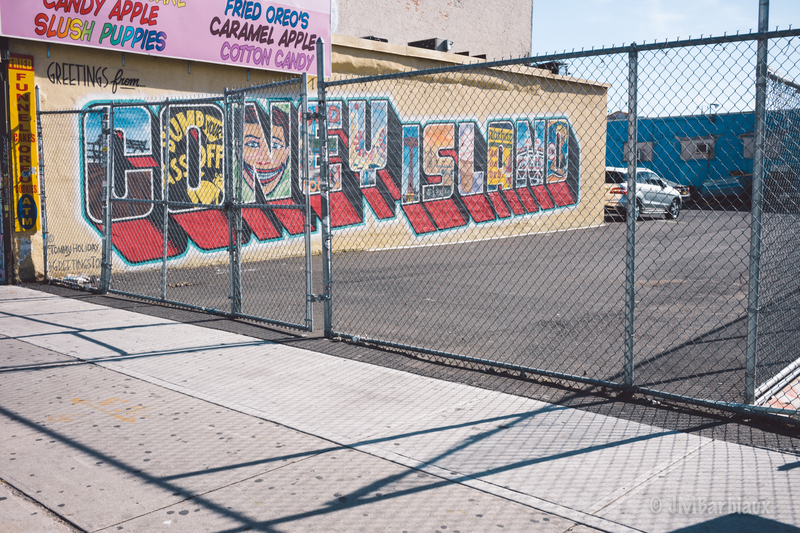 If you’re a street photographer looking for an idea for someplace to explore with your camera I highly recommend you add Coney Island to your list. Thank you for reading and I hope you enjoyed the images. Feel free to leave your thoughts in the comments section below. Follow me on Instagram (@PhotolisticLife) if you’d like a glimpse at current projects before I publish them on PhotolisticLife.com. The last time I was at Coney Island, it was 1977. I ate a hotdog, some popcorn, some cotton candy and then rode the ferris wheel, and … then threw up. Hahahaha, well at least you can say you didn’t hold anything back. That sounds like a great plan. It would be interesting to have your knowledge of what used to be to compare to what is now. Enjoy! Your shots are iconic!!! Good idea to photograph now without the crowds. I wonder if they are “open” all year omg? Thank you! I believe the theme park, which is called Luna Park, is only open from April to October. The boardwalk looks like it stays open all year long, though it’s not a boardwalk like what you’d find in many other places with retail stores all along it. The boardwalk is mostly the theme park, restaurants, and only a handful of shops that were mostly closed already.